Editor’s Note: On August 20, 2005, Luis Prada channeled Ashtar of the Ashtar Command to receive instructions for the planting of a quartz crystal in the Mojave Desert. This was the third channeling by telepathic reception he did that was actually recorded. The previous two were done unrecorded for the planting of a crystal in Mount Shasta that was done on Sunday August 14, 2005 by a Hispanic group led by Luis Prada. You may download this recording. Click the hyperlink, takes few minutes to download. Spanish only —Ashtar Shehran Channeling, 8-20-05, Download here . This work is part of a planetary project ofIshtar Antares and the Pleiadians. Original in Spanish, translation by Luis E. Prada. The planetary grid concept is not new, in antiquity Plato spoke about this in his work Timaeus as "the ideal body of cosmos" and explains the grid as the synthesis of the platonic solids. Also in other of his discourses he compares it with a leather ball made of twelve pieces, similar to the ones we know today as Football. For a long time these planetary grids were forgotten until in the last years through the remembering of some and the channeling of others it was started to be spoken of the existence of a Christed grid or spiritual grid that will support us in the change of the planetary consciousness we are living in today. And fulfilling the hermetic principle as above/so below the appearance of the Internet also proves that the spiritual grid has been materialized in other technological grid, created by the human hand, that today shortens the distances of the world. Let us say, all that is created or thought of is finally manifested in our dimension. But Plato was only referring to the geometric grid of the planet, we can say today that there are four known grids around our planet influencing human life. These, even though separate and functioning independently, are related in a sort of interaction where any change that occurs to any of them, affects the others. So we have:(1) the magnetic/gravitational, (2) the telluric, (3) the electric, and (4) the one of light/consciousness. It is known as magnetosphere and is the one that maintains us in our gravitational field around the Sun, it is intimately linked to our star, its energy is feminine. It is the one that maintains gravity and has been quite amply studied by science. It has the shape of a doughnut or toroid, it is of a magnetic nature as its name tells, and its size and form vary with the solar radiation. Its poles North and South are like two great cones, we may recognize the cone in the North with the phenomenon of the Aurora Borealis. This grid is connected to the magnetic axis of the Earth. Lately there have been a lot of talking about it because the variations of its axis might eventually produce what the scientists call magnetic Chaos, and others, change of dimension. Because of its feminine nature is a grid associated with emotions, therefore one of the consequences of its instability is also the emotional chaos. In the last years and due to its variations as a consequence of solar explosions and other internal changes of our sun we have lived an erratic swings of its axis to which many attribute the changes and polarization we have been living through. It is a grid linked to the collective unconscious, it is also of feminine nature, it is an emotional reflection. At the physical level it is a lattice of lines that extends on geological faults on one side and geopathogenic zones on the other, these lines are irregular and are generated by two very powerful planetary forces. The first force, the telluric, which is responsible of the adjustments of the Earth’s crust, its energies are immense and are released by the geological faults, the subterranean water currents and magma, it is like the circulatory system of Gaia, its vital force. The other force is the geopathogenic lines that form a lattice with the telluric ones, these are the ones being created by the accumulation of disharmonic energy, let us say, they are like the wrinkles and the experience of the Earth. These lines form in places where there have been conflicts, wars, slaughter, death and pain, they are the footprint of these facts that leave a sort of imprinted energetic pattern that makes those energies happen again and again in those same places, are like the scars on the earth. In antiquity this grid was known, that is why it was avoided to found cities or construct houses over the subterranean currents and the geological faults, as well as in the cemeteries and battle fields, knowledge also forgotten by the Westerners with the passing of time, and what has made that many of our great cities have been constructed over geological faults, for that unconscious necessity of the human being of living in intensely energetic places. Today the new science of Geobiology seeks consciously to heal these terrestrial marks and to change those disharmonic energies. It is formed by lines created by our civilization with the use of electricity, of high voltage, microwaves, television and radio waves. The name of Hartman was also given to this grid, after the last name of the German physicians that took the task of measuring it, to know its influence over their patients with illnesses such as cancer. Physically it is an electric lattice formed by lines of 8.25 inches (21 cm.) wide approximately, that create rectangles from 2 to 2.5 meters (6.56 ft. to 8.2 ft.), this one prolongs vertically arriving in some places to great heights where it feeds off of the relaying antennas of microwaves and the high voltage towers. This grid is like a reservoir where all the human-created electric energies are poured into and it has been determined that its points of intersection may be damaging to health if we stay over them for long periods of time. It is an artificial electric grid through which an enormous amount of energy flows. It is of masculine character. At the beginning of the Twentieth Century the theologian Teilhard de Chardin with his vision of the future foresaw this grid and called it the technosphere; other visionary, José Argüelles, has also taken this name developing many theories over its existence and predicting its demise at the fall of theTwin Towers (9/11/02) that according to him represented the symbol of this grid. Last we have the crystalline grid of the planet or ascension grid, this one is the geometric grid of which we said before was mentioned by Plato. The grid of Christ consciousness is of a bipolar nature, combines the feminine and masculine energies, integrates emotions and information, light and love. Physically it is an energetic structure that surrounds our planet reflecting and amplifying the ascension of our levels of consciousness. It is a crystalline matrix of light, formed by a dodecahedron and an icosahedron, one inside the other creating a great polyhedron converted into a sphere. It can be visualized as a geodesic sphere formed by pentagons and triangles, glimmering as a faceted diamond. It is the crystalline seed of the new consciousness of the terrestrial star. The grid of consciousness is anchored to the Earth at two axes. Great amount of energy flows from the North axis to the outside and enters again at the South and extends by 90 Km. above the terrestrial surface. It is a lattice of lines that has also been called ley lines; at the points of intersection of them are created energy vortexes that in turn coincide with so called power places. It is a fractal grid, let us say, it repeats infinitely to itself and it is of a holographic nature, let’s say, any fragment however minute contains the whole. This grid was also known to ancients and it is why many of the monuments, religious sanctuaries and places of peregrination coincided with its lines. It is called the Christ consciousness because it is an aspect of the collective consciousness that recognizes itself as a one only Being, it carries the potential of the Christ principle of unity. It is in that grid where is imprinted all the necessary information to experiment the Christ consciousness. 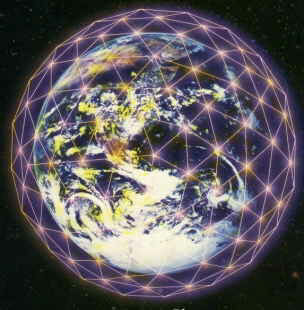 The ley lines are the footprint on the Earth of the Christ consciousness grid. In the places where these lines cross each other or where vectorially coincide it is produced a greater concentration of energy. Our ancestors also knew of this concentration and many of the mystical and sacred sanctuaries of antiquity were constructed over those coinciding points. There exist maps of this grid where it is established a number of 62 main vortices around the world with their respective power places. Thus we can see that the number 1 is strategically located over the outlet of the Nile and that its action area includes the pyramids of Gizah, Heliopolis in Egypt and Herod’s temple in Jerusalem. Other key point of the Christic grid is the number 18 that is located in the famous Bermuda Triangle and under which influence are no just the Caribbean islands, but cities like México, Caracas and Bogotá. That is why today many people feel the need to travel to those places and experiment the energy by being there, they are places that power the consciousness and serve by charging us with energy. Since in these places the Christ energy is powered, when we visit them we can feel or recognize this state of conscious union with the all: The loving state of the oneness. The grids reflect, and as an extension, regulate consciousness parameters of both, Gaia and spirit. The magnetic and telluric grids have been adjusted and readjusted in repeated occasions since the human being set foot over the terrestrial plane thousand of years ago and in the last years by the magnetic entity Kryon. The grid of light and consciousness have evolved with the increment of consciousness. It was since 1987 when Harmonic Convergence happened that our planet was included in the so called Galactic Confederation, and from there the level of Earth’s light has been exponentially augmenting. The magnetic grid with the work of the entity Kryon was adjusted to clear the veil that separates humans in their duality. The telluric grid has also been adjusted to increment the vibratory rate in the sacred places. The grid of light or of ascension has also had its evolution towards a more elaborate geometric model, capable of regulating a much more sophisticated code of light, turning into a much more faceted and complex crystalline matrix compared with creation’s sacred matrix called The Flower of Life [see Fig. 2]and more in accordance with changes of DNA we are all experimenting. It is through this geodesic crystalline matrix than in a not too distant future the cities of light, that are suspended waiting for the dimensional change of our beloved Gaia, will be anchored.